Martha Circle Bible Study meets this Thursday, April 11th at 1pm at Tabor for conversation, fellowship, and Bible study from “Gather”, the monthly ELCA women’s magazine. If you would like to subscribe to the magazine, please speak to Barb Moore. All women are invited. If you would like to dedicate an Easter Lily in honor of or in memory of someone this year they will be $9 for each lily ordered. Forms are available in the Sunday bulletins and orders must be in the church office by April 9th. Thank you to everyone who has made their Amazon purchases through Amazon Smile with Mount Tabor as their chosen organization. As many of you know, the Amazon Smile foundation contributes a small percentage of purchases to designated charities. Just go to this link http://smile.amazon.com/ch/87-0242854 , click on "Your Amazon Smile" under "Account and Lists" and choose Mount Tabor Lutheran Church of Salt Lake City as your charity. Then order away! Tabor's Faith and Science Roundtable meets at the University of Utah Monday April 29th at 11:30am in Room 208 (please note the temporary change) in the Research Admin Bldg. Our guest speaker is Dr. John Carey who will lead our discussion of the topic "The Evolution of Beauty and Altruism." Can human nature evolve into a more compassionate and generous state of being? Please see the Tabor website for the April 29 discussion articles and an interactive map of the campus. Shayna and Jason Wyasket are celebrating their new home in Sandy! Their new address is 11199 South Sandy Ridge Drive, Sandy, UT 84094. Going to the airport? Deng Hoth, our good friend and member of Mt. 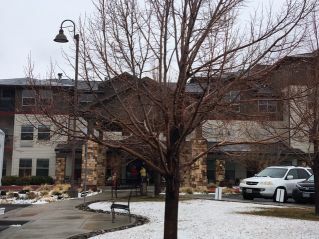 Tabor, provides transportation throughout the Salt Lake area, including airport pick-ups and drop offs, or transportation for any of your needs - or a friend’s! Please call him to make a reservation at 801-898-4406 . Please check your kitchens for any "Boxtops for Education" you might have clipped and collected over the past few months. These will be sent, in April, to the Navajo Lutheran Mission School in Rock Point, Arizona to benefit their education needs. It is amazing how they add up and what wonderful supplies they can provide for the school. You will recall that the Campbell Soup "Labels for Education" program has been discontinued so, if you still have some of these, just toss them away. You will be surprised how many different boxed and packaged products contain the "Boxtops for Education" so keep your eyes open for them. Please turn these in to Barb Moore or the church office during the month of March. 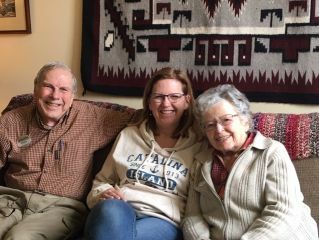 Barry and Marge Sauders with their daughter and their new home in Nevada. Council will be meeting on the third Sunday of each Month excluding Easter. 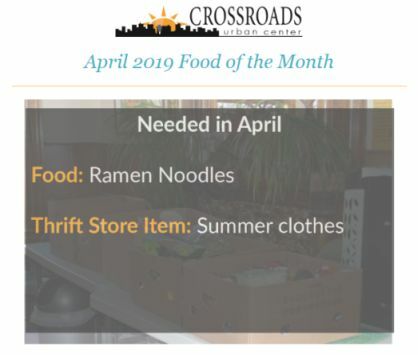 We will be sorting food on Saturday, April 6th from 10 a.m. to noon. Please join us at the Utah Food Bank, 3150 South 900 West, at 10 a.m. All are invited. The Tabor Trumpet deadline is the 20th of the month. Weekly bulletin information and announcements need to be in the office by Wednesday.